The latest digital technologies including 3D printing and the Internet of Things are crucial in delivering mass customization, increasing innovation, and boosting quality. It’s clear that manufacturers need to develop and execute strategies to seize on technological innovations if they want to continue to succeed. PwC’s 18th Annual Global CEO Survey found that global CEOs of industrial manufacturing firms recognize the importance of 3D printing, robotics and other technological advances to build better products. 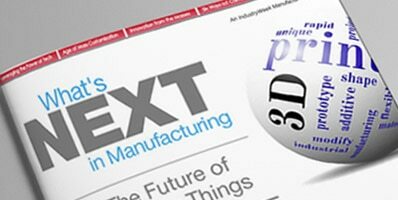 A radical shift is underway in how we “make things”, creating upheaval in the way manufacturers work, plan and think. The market is demanding customized and specialized products. It’s critical to think about customization and specialization during the up-front product development stages. Products are becoming connected in the age of the Internet of Things (IoT) giving designers and manufacturers more information for future product updates and upgrades. Learn more about the disruptive trends already underway in this comprehensive IndustryWeek Manufacturing Roundup.